Note: The contact for this page is Leon G. Konieczny. Click here for a Wisconsin surname search. 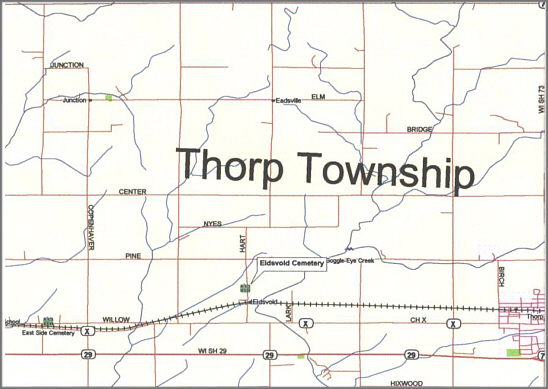 The township of Thorp is in the far northwestern corner of Clark County. It borders Chippewa County (which is to the west) and Taylor County (which is to the north). Originally a part of the township of Hixon (established by the legislature in 1873), on April 3, 1876 the township of Thorp was formed.  **I need some help putting together this township page. If you can supply a list of schools, churches and a history of the township, please let me know. I also need some pictures of this town, both past and present. If you have any news clips concerning the township in general, please enter the information on the "records" board and let me know, and then I'll link it to the appropriate page. 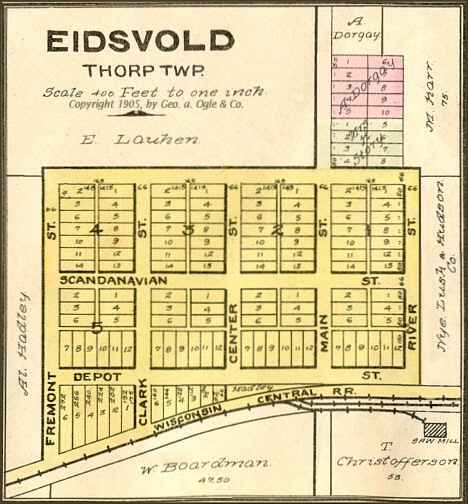 Eidsvold - Eidsvold was once a thriving community in the southwest corner of section 27. For more information including photos, see the Eidsvold web pages. Junction - Junction is the local name for an area in or near section 7 where at one time there was a junction of two railroads. White Eagle School and St. Mary Czestochowa church were/are located there. Stanley - Though the city of Stanley lies just outside of Clark County in Chippewa County and due west of the town of Thorp, it plays an important part in the history of the area. The Stanley Historical Society - Has an excellent museum. A great resource for the whole area. Thorp - The city of Thorp straddles the border between the town of Thorp and the town of Withee in the eastern part of sections 25 and 36. Thorp information is located on the here. School information for the city of Thorp schools is located in the Town of Withee pages here.